The pipe of Chioggia is a typical product of this marine town. It is built in terracotta with its marasca cherry or dogwood stem and today it is one of the most peculiar Chioggia souvenirs. 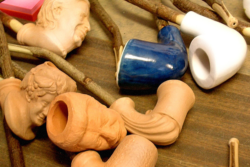 The earthenware pipes production began in the 17th century. At that time there were a lot of local workshops which worked the clay of the Po River in order to build the bowl of the pipe. The bowl was realized with two moulds of lead inside two wooden boards. The wooden stem was made out of cherry branches, drilled with a little gimlet. Thanks to the enormous amount of scraps of furnace that were found during several excavations made in Chioggia, it seems that this handcrafted activity was already highly developed during the 17th century, and it seems also that part of the production was meant for exportation. Today there is only one skilled artisan left: he still keeps this activity alive. After a long period of studies, he was able to recreate these pipes in their different shapes, like the simple terra-rossa pipe of the 17th century, the enamelled pipe with decorations of the 18th century and the typical yellow-ivory pipe of the 19th century. The pipe of Chioggia is a real sculpture and it can be used to smoke or also as a decorative object.